Nothing says Christmas like a red poinsettia! 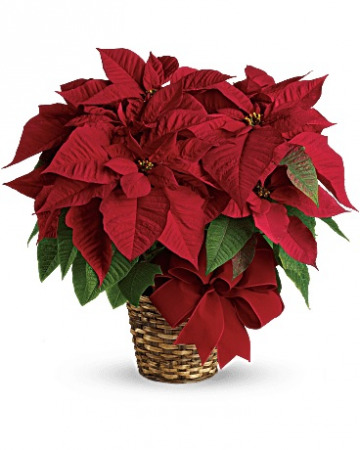 A traditional Christmas decoration; send this red poinsettia plant as a holiday gift - or keep it for yourself! The classic Christmas plant is potted in a 6-inch pot and presented in a natural basket decorated with wide velvet ribbon. 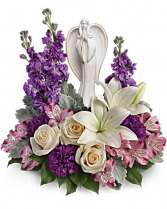 Show them they're in your heart with this magnificent display of roses, lilies and alstroemeria, gracefully surrounding a timeless angel sculpture keepsake. 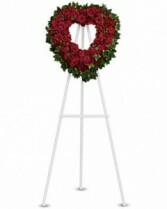 Beautifully fragrant, it's a tribute that will warm their hearts forever. 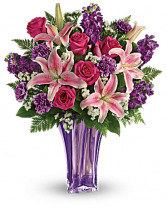 This beautiful arrangement includes crème roses, white asiatic lilies, lavender alstroemeria, purple carnations, lavender stock, dusty miller and lemon leaf. Delivered with Teleflora's Angel of Grace keepsake.